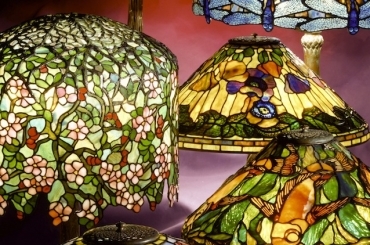 Tiffany Studios created geometric shades with many unusual details that individualize the look of the shade. The 14″ Geometric with Lustre Balls has the addition of a row of glass lustre balls bisecting the upper and lower portions of the geometric glass tiles. Each hand made ball has a Tiffany lustre surface and is held in place in a custom made, over sized jeweler’s style setting. The setting allows light to pass through and around each semi translucent ball to pick up light from within the shade. 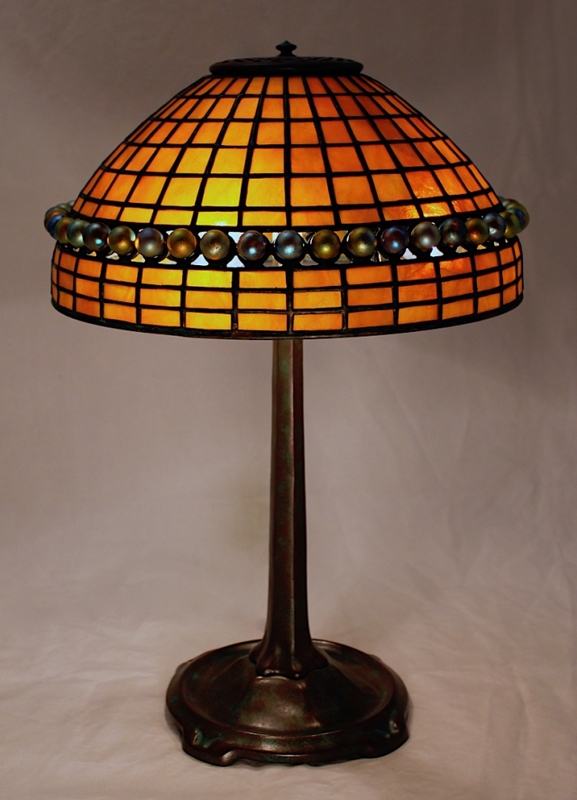 The geometric portion for this shade was cut from an orange amber glass made by the Chicago Art Glass company in the early 1990’s. The shade is shown on the Small Stick base (20″ tall) and was commissioned by a client in New York state.